Week 1 of this field report can be found here. The rainy 12°C days in Saint-Hubert Québec disappeared for most of our second week of NSERC CREATE Technologies and Techniques for Earth and Space Exploration Mars analogue mission operations at the Canadian Space Agency (CSA) headquarters. 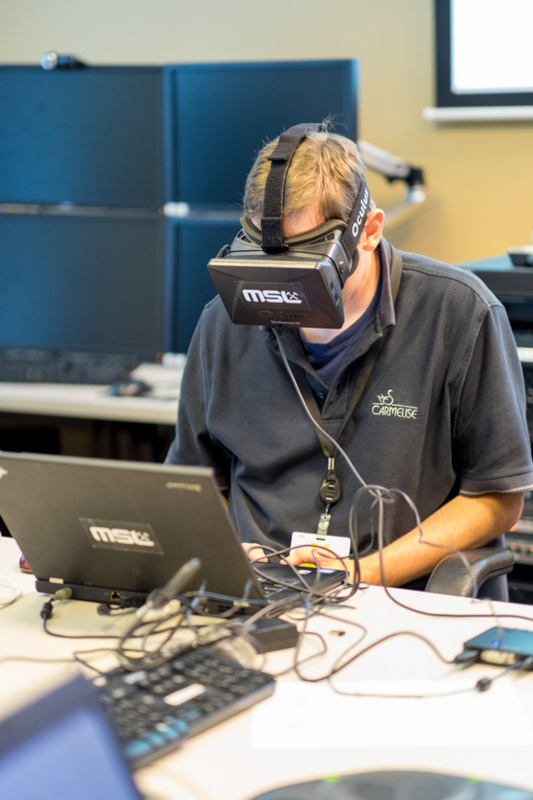 While this meant outdoor rover ops went more smoothly, our team Rover Manager, Dr. Brian Lynch of Queen’s University, went to work on a way to explore the CSA’s Mars Yard from indoors: A 3D visualization created using a combination of the Mars Exploration Science Rover’s (MESR) on-board LIDAR data and an Oculus Rift system. Alas there’s no way for me to share this visualization in this blog post, but trust me—it was pretty darn cool. Rover Manager Dr. Brian Lynch, a post-doc at Queen's University, "drives" around in a 3D view of the Canadian Space Agency's Mars Yard created using LIDAR data from the Mars Exploration Science Rover (MESR). A view of terrain around MESR generated from its on-board LIDAR system. But we couldn’t spend all our time playing with the virtual Mars Yard, so then it was time to head back outside with MESR and get to work! At the end of each day (“sol”) of operations, MESR is driven back into its bay for protection. Therefore, the first task of each sol is to drive MESR back to the exact location where we ceased operations the previous sol. 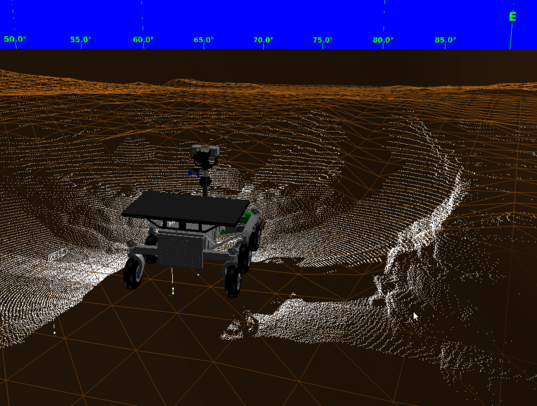 This position is determined using a combination of high-tech (GPS coordinates) and low-tech (manually driving the rover until it lines up with posts hammered into the ground at the end of the previous sol) methods. I took my turn at driving MESR into position on sol 7 of our mission, which just so happened to be my birthday. I got to drive MESR into its starting place for sol 7 of the analogue mission, which also happened to be my birthday. Squee! Our trickiest manoeuvre with the rover was also executed this sol. The science team back at Western University commanded the rover to drive to an outcrop at the mouth of a “channel” in the Mars Yard and acquire images with both its Zoom Camera and TEMMI (Three Dimensional Exploration Multispectral Microscope Imager). The tricky part was that TEMMI is no small instrument, and the area the science team wanted to image on the outcrop didn’t give TEMMI a lot of clearance. A lot of CSA engineers were on hand to watch MESR’s arm deployment and positioning to make sure the process went off without a hitch. A group of CSA engineers and CREATE rover team members carefully watch the deployment of MESR's Small Manipulator Arm (SMA). 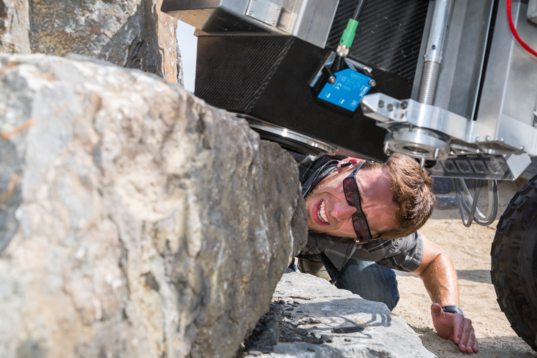 CSA engineer David Gingras keeps a close eye on TEMMI, which must make contact with a rock before it can image it. This location held a surprise for those of us on the rover team: When we approached the rocks, the geologists among us immediately noticed that a few of the rocks were chock-full of small fossils. These were not intentionally planted in the Mars Yard (although we had planted a piece of limestone rich in fossils elsewhere in the yard to see if the science team would find it with the rover), but were simply a result of where the rocks to construct the Mars Yard had been sourced. We then waited in anticipation as the Zoom and TEMMI images were acquired to see if the science team would be able to detect the fossils. 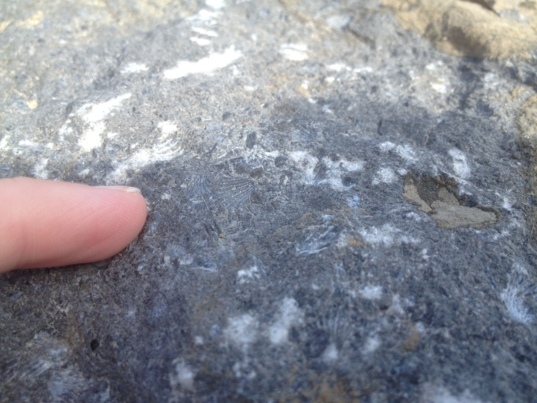 Close-up view of fossils in a rock in the CSA's Mars Yard. 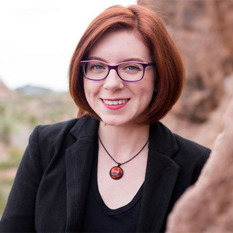 On the rover team side at the CSA, we were relatively cut off from what interpretations the science team at Western were making…but, we could tell that they had missed the fossils, as they then commanded the rover to drive elsewhere. Looking at the images the rover had acquired, it was easy to see that the fossils were missed essentially because of a Goldilocks effect: The resolution of the MESR Zoom Camera images was not high enough to make out the tiny features, and the TEMMI images too high in resolution. This emphasized to us the need and usefulness of an imager like the Mars Hand Lens Imager (MAHLI) aboard Curiosity. It was also another great example of the usefulness of human geologists—we were able to identify the fossils within seconds of walking up to the rock, while the rover spent 2 sols at that location and found nothing. After the final sol of operations, the science team from Western joined us rover team folks at the CSA to tour the Mars Yard. 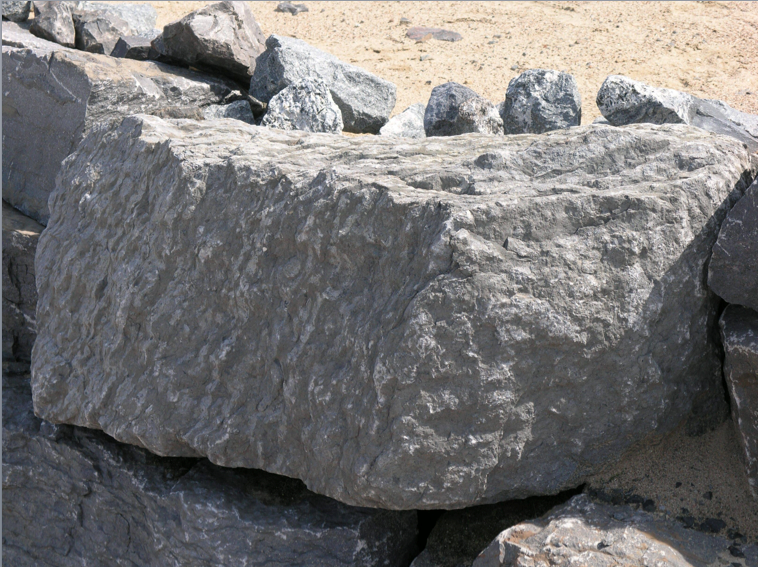 The goal of this was to show the CREATE trainees in the program the difficulty of doing geology remotely, and this point hit home for all of the students on the science team—especially upon their disappointment at learning that they had been mere centimetres from fossils and were still unable to detect them. How many interesting things (albeit not necessarily fossils) could we be missing on Mars simply because they are outside of what the rovers can see or measure? 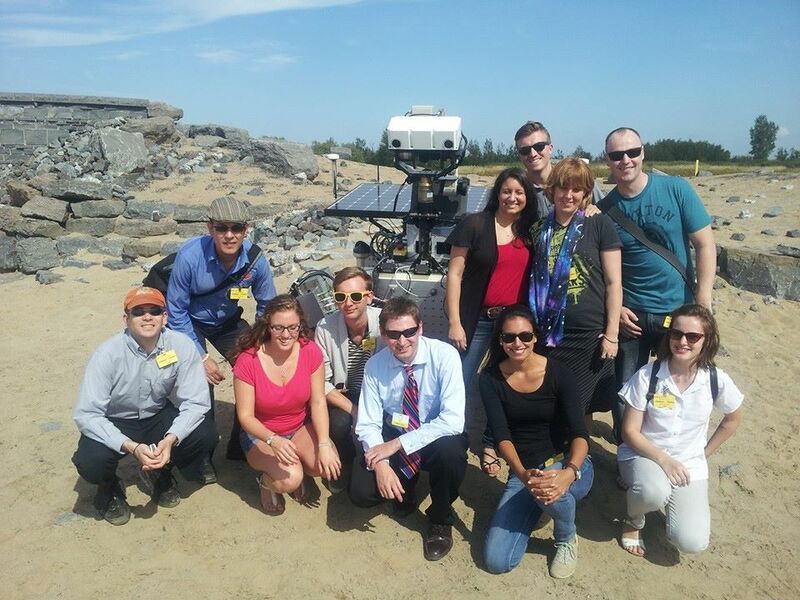 (Most of) the united science and rover operations teams with MESR in the CSA Mars Yard. All in all, the analogue mission was an excellent training exercise to teach students about what it takes to operate a rover mission. Having worked in operations for Curiosity before I came to Western, I felt this analogue mission did a good job of simulating the pace and complications of real operations, and all of the factors that have to be taken into account that might not be obvious to a casual observer. 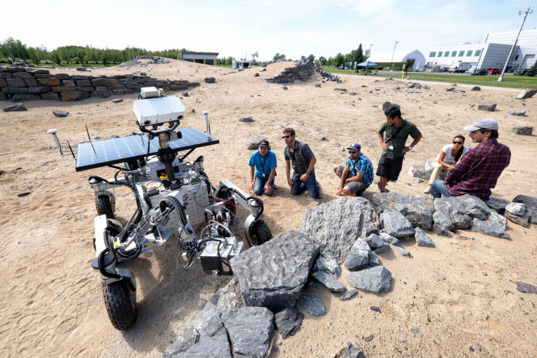 The goal for this NSERC CREATE program is to expand the analogue mission for next year, taking the rover to an actual field site rather than the Mars Yard at the CSA, to create an even better simulation of real operations.